20:23:00 As inseparable chicks until Glutton pressed in between ....Whether it today trying that again? Yes, # 2 and # 3 are always together, right from the start. #1 harmonizes nevertheless with the two. 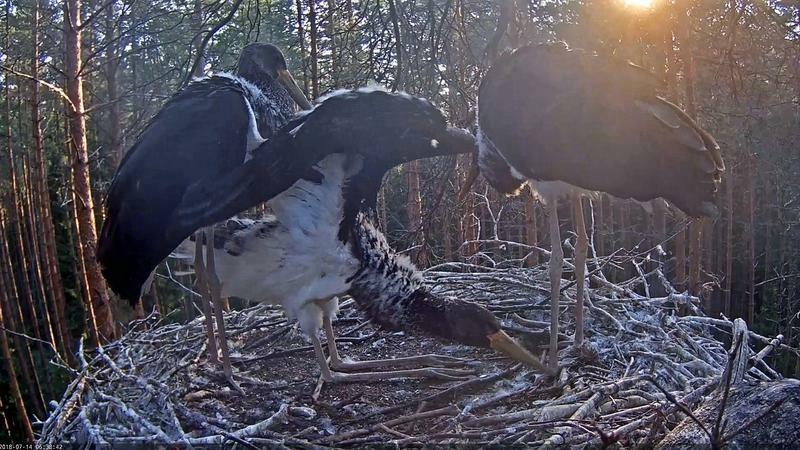 They are wonderful storks! # 1 always wants to be in the middle. 21:24 # 1 can already fly. He steps on the siblings. Tomorrow we try to equip chicks with transmitters, hope to starts about in 10 AM. For that we need to take them from the nest and afterwards back to the nest. Thanks for the information, Urmas. Swenja and Ute, many thanks for your reporting! Thank you for the information. I hope all will go well with the climber and the storklets. Good luck! I thought it must be this weekend. 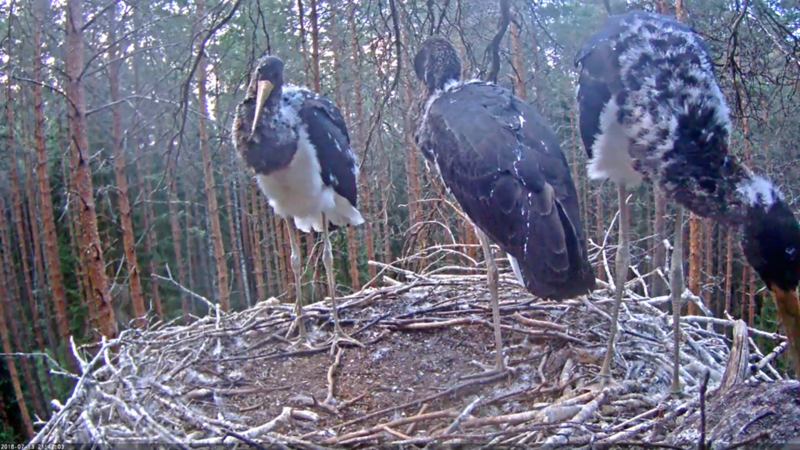 There are 11 days difference to the Latvian storks in 2015. They hatched May 11 - Transmitter July 3! 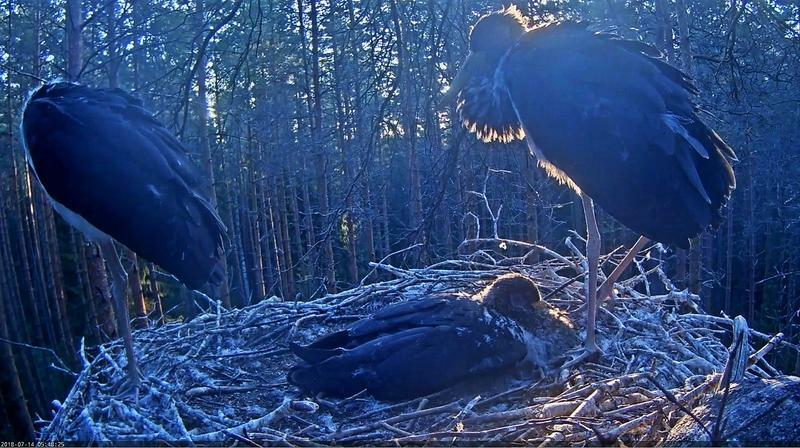 Our first storklet hatched May 18 - Today is July 14! So it is time to do it. The weather will be good for that! Partly cloudy with rain showers in places, risk of thunder. Locally fog. Northerly wind 1-7 m/s. Air temperature 13..17°C. 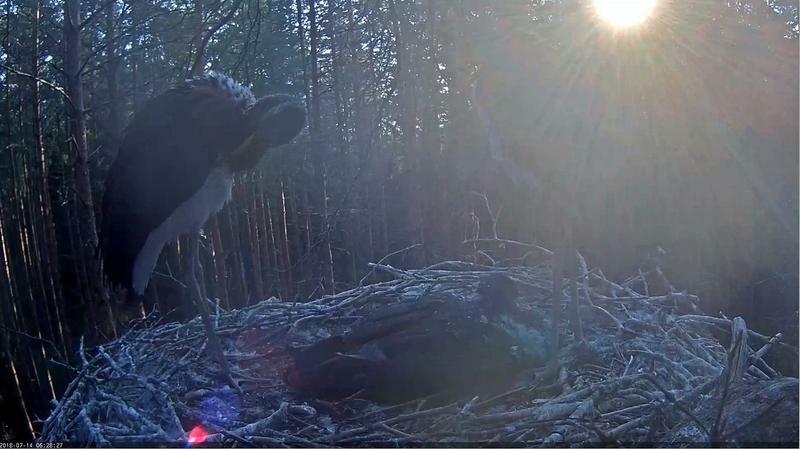 6:32 Two storklets are preening themselves .. one is laying in the nest. Thanks for the information and a happy ending for all concerned! 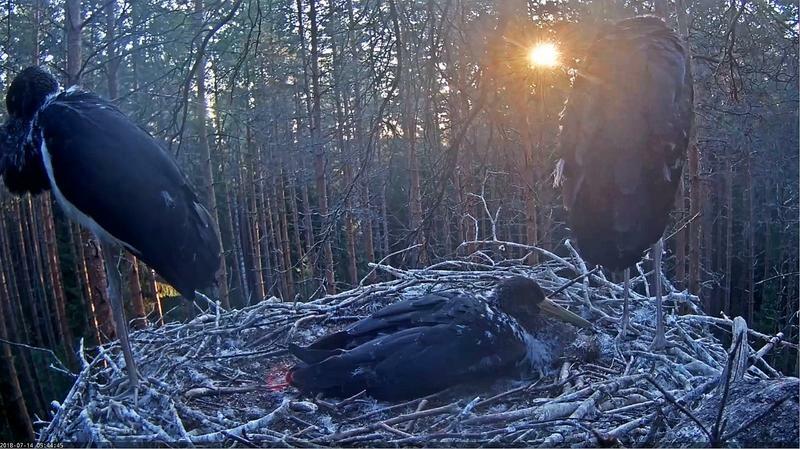 9:13 still no breakfast for the storklets. Karl first proposes his belly full of fish that has provided him Urmas. But no one knows if Karl feeds the Joungsters with these fish. Especially not when. Attaching the ringing and transmitter will be a big challenge for Urmas and his team today. The young storks are very nervous today. They are very big and strong. I always think: everything will be fine! Good morning. Important morning, what we have waited so long. I hope that Karl and Kati are both far away fishing-hunting. We aren´t nervous, are we?? @UteL. 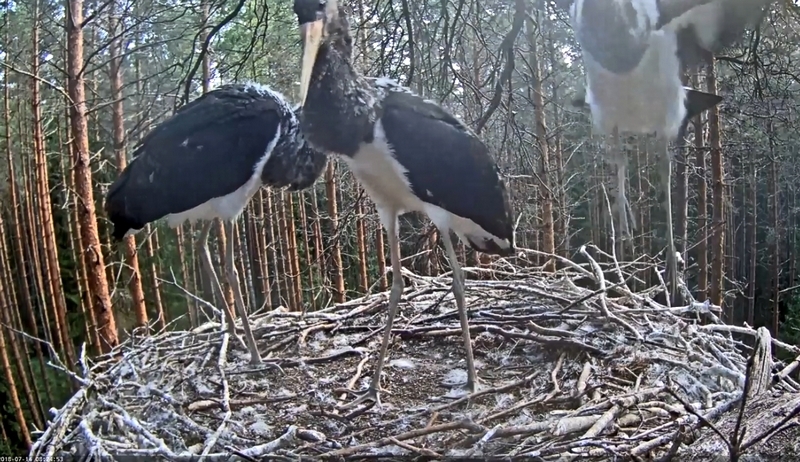 When Urmas visits the young storks, they'll probably fly away quickly. Even if they jump out, their wings are strong enough to land safely, but accidents can happen. 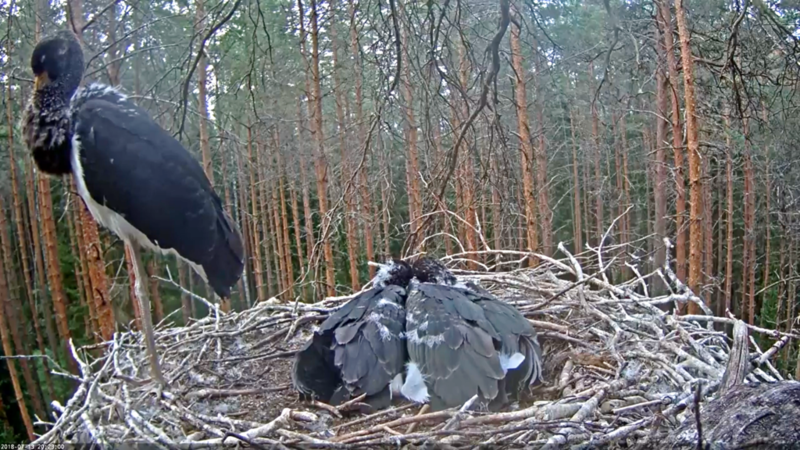 Dear storklets, your friend Urmas will visit you pretty soon.